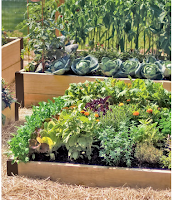 There are many reasons and benefits quite frankly to using raised beds in gardening. The beauty of thinking about gardening at this time of years is that you can begin to plan for raised beds. For example, will you use them for flower beds or for your vegetable garden? Or both? 1. Your growing season is longer. Because the bed is raised the soil warms up sooner and therefore you can plant sooner! You get a head start on the growing season. Sure, you might need to cover the tender plants some nights, but that is not really a big deal when you think about the bounty you will get. 2. It is a lot easier on the back! If you are like me and have the occasional bout of back issues, you know what I mean. The fact is you don't need to strain your back to prep, plant, weed and/or pick your just rewards. 3. If you have a few raised beds you can use mulch or stone between the beds to create walkways that keep your feet clean when working around the gardens. And better yet, when it is raining you can still get to parts of your garden without getting muddy. So, if you want that tomato or some herbs, you can keep your feet nice and clean. No mud. 4. Another important point for me was improving the quality of my soil. I have a lot of clay in my soil and by doing a raised bed, I was able to drop in fresh new soil that I was then enable to enrich accordingly. Much better for my veggies and ultimately those that consume the goodies. 5. It is also easier to weed a raised bed garden and I would dare say that there are less opportunities for weeds to take hold. A win win as "they" would say. 6. While I have a decent sized garden - 8'x12' - having a raised bed also means that I don't need to till. Sure, I give it a really good soil turn and feed the soil in the spring, but that is it. Much simpler to do and no worries about maintaining and storing a tiller. While there are many options for making raised beds, I used these joiners from Lee Valley to build my veggie garden. 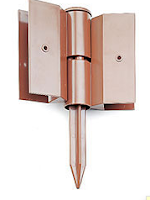 They are super easy to use and are adjustable to make 90 degree corners or other angles you wish. Simply get your untreated cedar and get started. 7. Finally, I find that raised beds just look nicer. There is something about the crisp lines, the visual height that is added and the bounty that overspills the walls. I love the look. This is by no means and exhaustive list. There are many other great reasons to have raised beds. 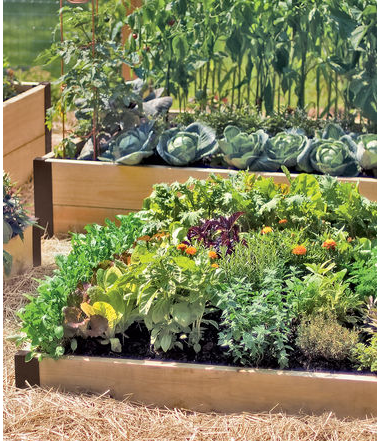 I would love to hear how others are using raised beds and what benefits they see in using them. After all, one of the great joys of gardening is the sharing of the bounty and the knowledge that we all have.